Recreational Pot Shops Now Open For Business In Massachusetts Two marijuana dispensaries opened their doors to customers 21 and older on Tuesday. The mayor of Northampton, Mass., was the first in line at one store, calling it a "historic day." 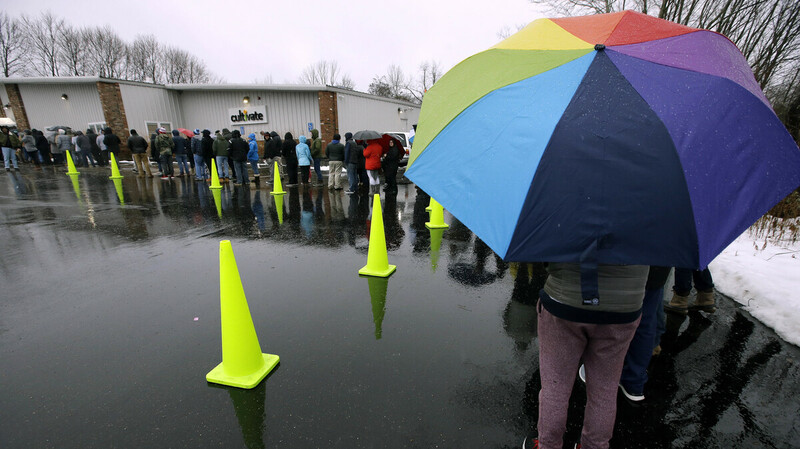 The rain didn't stop customers from lining up outside Cultivate in Leicester, Mass., on Tuesday — the first day that sales of recreational marijuana became legal in the state. Two years after Massachusetts voters approved the recreational use of marijuana in the state, adults with a valid ID can now buy some Moonshine Haze and a slew of other cannabis commodities. As of 8 a.m. ET, Tuesday, two Massachusetts marijuana dispensaries opened their doors to customers 21 and older seeking recreational pot, a first on the East Coast. Cultivate in the city of Leicester and New England Treatment Access in Northampton had already been serving customers seeking pot for medical purposes. Now they have opened up their menus offering loose leaves, pre-rolled joints and vape pens, as well as enhanced candy and cookies. To gain the adult-use licenses, the two establishments "underwent thorough background checks, passed multiple inspections, and had their products tested," according to the state's Cannabis Control Commission. Voters in Vermont and Maine have also approved recreational marijuana use — the only other East Coast states to do so — but no shops have opened yet in those states. Nationwide, 10 states have legalized recreational marijuana for adults, while 33 states as well as Washington, D.C., have approved it for medical purposes, according to the National Conference of State Legislatures. However possessing, selling or using marijuana is still illegal under federal law, opening up users to hazy legal ground, particularly if they are caught traveling with it over state lines, which is a federal offense. Early Tuesday in Northampton, people lined up in the pre-dawn rain in anticipation of New England Treatment Access opening its doors. Northampton Mayor David Narkewicz, an Air Force veteran who bills himself as a progressive, made the first purchase inside the shop, handing over cash to rounds of applause. Turning to news cameras, he said, "I'm proud that Northampton is playing a role in this historic day, ending some 80 years of prohibition here in the commonwealth of Massachusetts and moving into a new modern era where we have safe, tested, well-regulated, adult-use marijuana." The store's co-founder, Arnon Vered, thanked the mayor and offered this advice: "Remember, go low and slow." The state's Cannabis Control Commission says retailers in Massachusetts cannot legally sell "more than 1 ounce of marijuana or 5 grams of concentrate per transaction" — also the possession limits in the state. Up to 10 ounces of marijuana is permitted within the home. It cannot be used in public or on federal land. In Leicester, about an hour east of Northampton, the rain also couldn't hold back eager customers awaiting the opening of Cultivate. Iraq War veteran and medical marijuana advocate Stephen Mandile, accompanied by his service dog, made the first recreational pot purchase. Mandile, a founder of the nonprofit advocacy group Veterans Alternative Healing told The Boston Globe it was "an honor" and that he bought a pre-rolled joint and an eighth of "Jack Kerr." Tuesday could be the beginning of a budding enterprise in Massachusetts. As member station WBUR reports, the Cannabis Control Commission has already issued provisional licenses to 20 additional retailers, even as it processes applications from other businesses.